We talk a lot here at the Baby Sleep Site™ about how all babies are different (that’s why we don’t believe in any one-size-fits-all solutions for baby sleep problems!) Here’s something else we believe: parents are different, too! Talk to 10 different sets of moms and dads, and you’ll likely uncover a variety of parenting methods and philosophies. It’s our belief that this diversity is a good thing. It keeps life interesting! Both types are perfectly fine, of course, and then there is everything in between (i.e. predictable schedule with flexible days). But when it comes to creating healthy nap schedules for our babies — the kind of schedules that produce long, restful naps — is one type better than the other? This kind of predictability makes it easier to nap train your little one — remember, consistency is a huge part of any kind of sleep training! And once your baby is successfully nap trained, having a fairly rigid schedule in place can go a long way towards helping your baby get long, restorative naps on a regular basis. But, what if your baby doesn’t get sleepy at the same times every day? Or, what if your family life is such that your day simply is not very similar day to day? A flexible baby sleep schedule allows you to have much more flexibility in your day. Your playdate wants to meet at 10 instead of 11? No problem. That baby swim class is at 1 p.m. twice a week right when your baby’s nap is. No problem. Grandma and grandpa come to visit for two hours making bedtime an hour later? No problem. Having a flexible sleep schedule is definitely appealing in many ways. It feels much less like your whole world revolves around your baby’s sleep and schedule, that’s for sure. Don’t Forget To Consider Your Baby’s Personality and Temperament, Too! Before we get any further, I have to stop and point something out. We started this discussion with a comparison between parent personality types. And that makes sense; we parents are the ones who create our babies’ schedules, after all! But you’ll need to consider your baby’s temperament and personality as well. Specifically, you’ll need to consider your child’s adaptability and regularity. Your little one’s adaptability refers to his ability to “go with the flow”, so to speak. Highly-adaptable babies adjust easily to changes in the schedule and routine; less-adaptable babies don’t. What does this mean for you? If your baby is less adaptable, you’ll probably need to develop a fairly consistent daily schedule. If your baby is more adaptable, however, you can probably have a more on-the-go lifestyle. 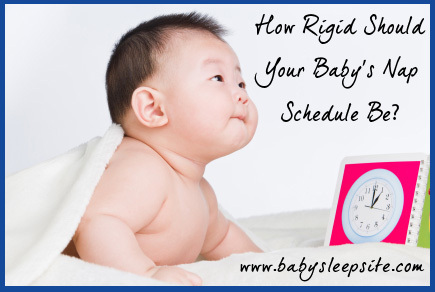 Your baby’s regularity refers to the kind of consistency he shows from day to day. Very regular babies tend to eat and sleep at the same times each day. As Nicole points out, they may even poop at the same time day to day! Less regular children, however, are inconsistent in their eating and sleeping habits. What does this mean for you? If your baby is less regular, you’ll need to build some flexibility into your daily schedule, in order to accommodate. So, Which is Better: Rigid or Flexible? Nap Tele-Seminars — Another great members-only resource? Our tele-seminars. Hosted by Nicole herself, these 30 – 45-minute tele-seminars offer you insider-information and our trademark sleep coaching methods and techniques. We have several awesome nap-focused tele-seminars, including one on managing nap transitions, and one on lengthening short naps! Listening to these seminars is like getting a coaching session from Nicole! She’ll walk you through the basics of dealing with common nap problems and give you tried-and-true strategies you can implement at home. While our Members Area is great for DIY moms who prefer to tackle sleep challenges on their own, we know that other moms much prefer to go straight to one-on-one help. Well, good news – we offer that, and you can start getting the personal help you need TODAY! You can teach your baby a new way to nap – and we can help. We have helped thousands of families around the world with their babies’ nap trouble, and we can help you, too! Take a look at our consultation packages, and see which one looks like a good fit for you. Once you purchase, you will immediately receive access to the Helpdesk, and you can set up your account, fill out your Family Sleep History form, submit it to a consultant, and get started on the journey to better sleep! Rigid or Flexible: which are you? Share your “schedule type” below, and tell us about your experiences creating a nap schedule that works for you and your baby! I am very similar to Kate and Christi. We have a set bedtime routine that begins at 8pm and my 5 month old guy will fall asleep between 830 and 9 every night. Some mornings he wakes when I wake at 5am and refuse to go back to sleep. Sometimes We have to wake him to leave in the morning. On the weekends, we all sleep until about 9. I am concerned about his naps though because he doesn’t have a “schedule”. We are more of the flexible nappers . He is awake 2 hours and then naps. Sometimes he’ll go 2.5 hours. Sometimes his naps are 30 minutes and sometimes they’re 1.5 hours. I don’t know if I should have his caretaker try to get him on a clock schedule or if What we’re doing is ok? He is the only child that our caretaker watches, so it’s not a “convenience” issue for her when his naps are sporadic. Should we have the caretaker start trying to sleep train by the clock? I hope this helped answer your questions! If you need anything else, please let us know, we are here! @ Kate — Two easy ways to help develop a more clock-oriented schedule include establishing a consistent bedtime and wake time. Try to pick times that work well with your general schedule. There will certainly be days when bedtime and morning wake time may vary, due to schedule, but if you can stay consistent most of the time, that will really help your son get into a nice rhythm. Does this help? Thanks for commenting, Kate! My situation is kind of like Christi’s: my 6.5 month old baby wakes up at irregular times. Most days it’s around 7:30, but sometimes he has to get up at 6:30 to come to work with me, and other days he sleeps until 8:30. It makes it hard to schedule naps by the clock. Nap length varies as well. Would you recommend waking him up in the mornings to gain consistency? Or putting him down for naps at the same time every day anyway (even if he has only been awake for an hour)? @ Christi — this is a good question. I’d say it depends on the age of your baby, to be honest. I think the kind of floating schedule that you describe here is perfect for a newborn or a young infant (maybe up to 6 months). During the first six months, it makes perfect sense to create a schedule that’s driven by your baby’s rhythms and needs and not by the clock. I think that for older babies, though, a more clock-based schedule is appropriate. And by the time you reach the toddler stage, having the same bedtime each night is important, since it provides consistency and helps reinforce the daily routines and schedule. I feel like I am a little bit of both rigid and flexible all at once. We rigidly “float” my baby’s nap schedule, i.e. we go by awake time rather than a specific time on the clock, so my little one naps for however long he naps for, and then is up for an hour and a half until his next nap. The problem: a floating schedule means bedtime is at different times every day. I was wondering whether you think having a regular bedtime is better than having a floating bedtime. I know routine is important, but sometimes if he naps late, it is really hard to put him down after only 45 minutes of awake time, and on the other hand, if he naps early, it’s hard to keep him up long enough to reach his “bedtime” without having him hit his second wind or pass out from sheer exhaustion while I’m nursing him before bed. @ Karen – good for you for doing what you know is best, in spite of pressure from others! @ Diana – thanks for sharing the details of your experience with us! And you’re right; flexibility is key. Well said! Thanks for commenting, Diana! I think it is simply about what your baby needs. My now 6-months old is on a pretty nice schedule. Sleeping at night 8pm-6:00 am and has two naps during the day, all sleep happening in his crib. But it was not like this until about a month ago. For the first 2.5 months he wanted to nap in my arms only, could not do absolutely anything about this. Then at 2.5 months he started feeling uncomfortable in my arms, but still refused to sleep in his crib. So he was napping during the day, only in the stroller or in the swing at random times for random amount of time. Around 5 months, he started rolling on his belly, and he preferred this position to sleep and then he refused to sleep in the swing or stroller. At that point I moved him in the crib. And the moment I put him down, he goes instantly on his tummy and sleeps like that. It took him about 1-2 weeks to get adjusted to the crib, during the day but now he is fine. In the beginning he kept waking up a few times during the nap, but I went, picked him up, rocked him and then he was falling asleep again. Now he doesn’t need this anymore, he simply sleeps. Unless he is not feeling well, and that is a different story…..On the other hand he always slept in his crib at night. And 8 pm for the night was not a time that we decided on, was the time that we observed to work best for him. Basically flexibility on my side and trying to figure out what my baby needs helped me stay sane…. I have my 8 month old on a great schedule – or perhaps it’s that he has me on a great schedule. Either way, he is a very happy baby and I get many compliments on that. However, people are also quick to tease me or at least comment on my rigid schedule. But I contribute his pleasant demeanor to his schedule. If he begins to fuss and get cranky, he’s either hungry or tired. He has napped in his port-a-crib at times when we are out also, but usually not as long as he normally would if he was home in his crib, and it also takes a bit longer for him to settle into his nap. Thank you for the kind words! Much needed. @ Audrey — “they win if they aren’t getting what they need sleepwise” — amen to that! Yes, yes they do. Our little ones don’t exactly push through exhaustion the way we adults do (which is probably a good thing, actually). I’m glad to hear that you’ve made peace with your Type A-ness, and have found something that works for you. And good for you for sticking with what you know is best for your son!